Delphi XE7 is out with version 21.0.17017.3725; Spring4D is almost ready. Remarkably few people note the actual version number of the Delphi releases, though that is the version mentioned in any QC reports. QC version number for Delphi XE7: 21.0.17017.3725 (Update 1 has version 21.0.17707.5020). I got that number from the first XE7 report in QC posted almost 2 months ago (and verified it against other reports), so it seems XE7 has undergone some serious testing. Be sure to have at least 60 gigabytes of free disk space before you attempt to install. XE7 Documentation root: RAD Studio. Installation Notes for XE7 – RAD Studio. What’s New in Delphi and C++Builder XE7 – RAD Studio. On the Spring4D side (yes, it has a new logo! ), Stefan has added XE7 support, so a new release of that is near. An interesting thread by Vin Colgin – Google+ – IDE FixPack 5.4.1 shows 36.5% increase in BUILD speed under…. suggestion by Ilya S on installing Microsoft KBs to improve speed (especially on Windows Vista, Windows 7, and Windows 2008 Server): List of currently available hotfixes for the File Services technologies in Windows Server 2008 and in Windows Server 2008 R2. You can view your updates when browsing to the Microsoft Update Catalog from your Windows machine. There are (soon probably “were”) a few very interesting Q&A threads on Stack Overflow in the “Hidden Secrets of” series on Delphi related topics. I sort of can get (but don’t agree: there is a very good voting system to de-emphasize material that is not useful, but who am I to argue with the minority of “the world is black and white, we just follow the rules” diamondss) that these get closed, but cannot get that very useful material gets deleted for anyone with less than 10-thousand reputation. Hidden features in the Delphi language? – Stack Overflow. Hidden Features of the Delphi IDE – Stack Overflow. delphi – Hidden Features of Oxygene – Stack Overflow. @Jeroen & David, I’ve deleted my off-topic comments from here. Could you do the same, please ? I’ve also asked moderators to delete my meta question as it seems the users there are not even humans. Never mind. Stack Overflow is not what it was few years ago as I observe. It’s getting worse. Another piece to this mosaic was running the portuguese version of Stack Overflow ideal for cross posting between the sites. From long ago, but still very valid, as I recently had another question like “what design patterns does Delphi use?”. 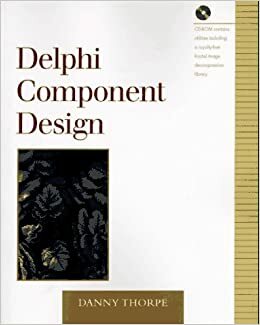 The Delphi usage of patterns to make the VCL and your applications work is one of the reasons I like the Delphi Component Design: Danny Thorpe so much. Do not let you scare by the book title: a lot of information in this book is much broader than designing components. It is about why and how things are done in the RTL and VCL, and which patterns you can use yourself. Try and git it while you can still get it. It is excellent, but rare to get as it has been out of print for a while. Only a minority of the Delphi developers knows that every Delphi developer uses a Factory pattern (delphi.about.com has an example in “regular” Delphi), but then implemented using virtual Create constructors. Virtual constructors are to classes like virtual methods are like object instances. The whole idea of the factory pattern is that you decouple the logic that determines what kind (in this case “class”) of thing (in this case “object instance”) to create from the actual creation. The first use in the Delphi RTL is how the whole creation process works of forms, datamodules, frames and components that are being read from a DFM file. The form (datamodule/frame/…) classes actually have a (published) list of components that are on the form (datamodule/frame/…). That list includes for each component the instance name and the class reference. A regular Delphi developer usually never sees that happen, but without it, the whole Delphi RAD experience would not exist. Allen Bauer (the Chief Scientist at Embarcadero), wrote a short blog article about this topic as well. There is also a SO question about where virtual constructors are being used. –jeroen via: What Design Patterns do you implement in common Delphi programming? – Stack Overflow.